Title : Unplugged Play: No Batteries. No Plugs. Pure Fun. There are some parents who always have crayons, bubbles, and homemade play-doh on hand. Their children are adept at drawing, cutting, and pasting, can reliably kick a ball, and are the first to join in the games at birthday parties. To these lucky kids a homemade birthday cake in the shape of a tyrannasaurus rex is no big deal. Their parents do not need to read Unplugged Play.For the creatively challenged among us, however, this is a great resource for making your time together count. It's filled with hundreds of articles with activities for ages 1-10, each with a sidebar giving the number of children needed, indoor/outdoor location, and materials needed. I especially like the fact that it is organized into three age ranges, printed so the sections are visible on the fore edge so a harried parent can flip the book open and start looking for ideas. 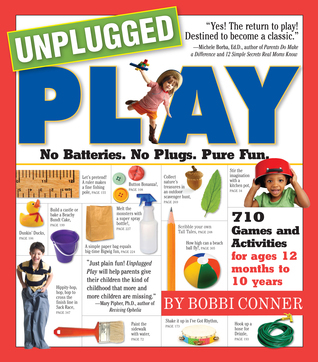 There is an introductory chapter describing the benefits of non-media play, and appendices with suggestions for family game night and materials to keep on hand.Some of the activities require materials you may not have, and many will not fit the personality or specific interests of your children, but the book provides a wide variety of options to satisfy most needs. It may be especially handy when caring for children you do not know well or who are a different age than you are used to. Because of its exhaustive content, it's probably best treated as a source of inspiration rather than a to-do list, and after using it for a few weeks as creative "training wheels," parents and children may find that they no longer need it. Ironically I picked up this book at the small, local library while on vacation where we did not have access to computers, television or even radios! This book is AWESOME! I plan to purchase a copy to have on my bookshelf permanently. What I love about it is that it gives TONS (710 to be exact) of ideas for games and activities for children ages 12 months through 10 years. I have collected several books over the years that focus on keeping babies and toddlers entertained (because there seem to be a lot more of those out there) but this one goes further and offers so many great suggestions for older children (which I have now). It will be hard choosing where to begin! The book is very well organized and most of the ideas require very little planning in terms of set-up, supplies or just doing! There are activities for groups of kids, families or kids on their own. And although you may look at some of the ideas and thing “well, I already knew that”, it’s great to have them all in one handy resource. This book has solutions to a daily parenting difficulty of mine--what to do with the kids while cooking dinner or getting something else done? It also has suggestions for quality parent-child activities. I almost always just read books so it is good to have more ideas. Many of the ideas in this book are great for developing imagination, physical development and other skill building. Just this week I used two of the group activities when it was my turn to organize some activities for playgroup. I covered a table with butcher paper and let everyone draw--the adults enjoyed this one as much as the kids. I brought a jump rope for a bridge game--run under, jump over, crawl under. I checked this book out from the library and I may just have to buy it. This is a must-read for any parent with young children. The book is full of suggestions for games, activities, crafts and other back-to-basics projects to occupy kids during "screen free" time. I had so much fun working my way through the inexpensive ideas in this book, I renewed it from my library not once, not twice, but three times. The suggestions are great, and often require simple household items you probably have on hand. Many are appropriate for child-led play, although some do require the help and guidance of a grown-up. I felt almost everything in the book was appropriate for my four and six-year-old kids. Hours of entertainment free of batteries, plugs or Internet connections. It can be done! I got this book from the library for some fun play ideas with my 3 year old, especially things that he can do while I'm prepping dinner or other hands-on tasks. The mommy-blogger/Pinterest world alternately intimidate and annoy me; I'm looking for something low-tech, low(read: no)-cost, and that doesn't involve a lot of backstory for my son to understand.This book did fit the bill on all of my criteria, and was helpfully divided by age group and then further sub-divided into categories like "busy-body play" and "self-directed play." There are great call-out tips sprinkled throughout as well, like bringing an artistically inclined preschooler to a free First Friday show. There are also quotes from various medical professionals citing the importance of unplugged play, but I found those to be tiresome and preachy. Obviously I believe in the importance of no-tech play or I wouldn't have picked up a book on the topic. It began to come across as smug and holier-than-thou, and I think there's enough competition and judgement in the parenting world already. A little bit in the intro would have been sufficient, without adding it throughout every chapter.Unfortunately my son didn't get into any of the ideas I tried from this book. I experimented with activities from ages both above and below him in case it was a maturity issue, but he wasn't a fan. I think I'll revisit in the future because a lot of the activities in the grade school section look fun (making comic strips? yes please! ), but the toddler/preschool bits weren't fitting the bill for me.For now, I'm better off just remembering the stuff I did as a kid and sticking with that. Simpler is better, which I suppose is the whole premise of the book. Most of these activities are like watching paint dry. I applaud the idea, so I feel bad about giving this such a low review. I love the pre-school websites much better. They have much more unique ideas to print. Just for fun, we have a no-TV, no-computer rule -- only at Grandma's house (because we want the children to like her and hate us). It's really tough without TV -- TV is a fantastic babysitter. Here is an example from the book: skipping rope -- what you'll need -- a rope and a flat surface or pavement. Here is my idea: Take the laundry basket with the kid's socks that have no matches (which is, like, all of them except for 4 pairs) and throw them at the turned-off TV. TV is the devil. It's melting your child's brain anyway. I REALLY like this book. Well I like the concept of everything in it. Although Kimzey and I do many of these things alrady listed. Not that I am super mom. But we do spend quite a bit of time under the coffee table pretending to be camping, or at the dentist etc. This book does help you "unplug" and get back to the basics. However we ALWAYS have music playing in the background while at home. Hey I can't totally get "unplugged". I would recommend this book to anyone with kids, any grandparent, child care worker, camp counselor, etc. This is the book I pull out when ever my kids say they are bored or get restless, or when I am babysitting. It is full of fun activities that are so much fun, yet so simple that I want to give myself a V8 smack. Most include things you have around the house, like socks, balls, paper and laundry baskets. There are activities for different ages, group sizes and settings. The variety is amazing. There is an appendix in the back that gives great examples of toys and games to have on hand. Definitely a must-have! It's not that this is a bad book. I only looked at the middle section (it is divided by age groups). I found it overly simple and yet overwhelming. Some activities seemed too boring for my kids, but I guess that is the point of so many ideas in one place- you find what you want to try! I'm also more of a ( can I say it here?) Pinterest person for this sort of thing. Then everything I think is cool is in one place and I don't have to sift through a whole bunch of ideas just to find one that interests me. Does that make sense? Skimmed through this for some ideas to help entertain the kids. Some ideas were extremely simple (e.g., tying knots with pieces of ribbon, throwing whiffle balls into a laundry basket) and some were a little more complicated (e.g., pretend play shoe store, making caterpillar soup). The things we did try didn't keep my kids busy for very long (maybe ten minutes at the very most), but there were so many ideas that we'll revisit this book again soon. I like this book not just for the ideas, but for how you can make the ideas your own and mix and match different parts of the games. I have trouble playing with my kids because I am easily bored and my mind wanders. But some of these games are fun. And it is great to see little children learn that the world is (mostly) predictable and full of fun to explore. It is also cute that kids really like to imitate adults so that they can gain control of their circumstances, even during play. This book has some great ideas for activites to play with your kids. I have tried a few with my son and we had fun. Some activities I thought were just taking up space. Yes, duh, catch is a great activity to do with your kids. Do you really have to put that in there? I would rather have fewer really good ideas for activites and take out the obvious ones. It is nice she seperates the activites by age and type. That is helpful. Definitely a book I would like to own. Why did I ever waste my time on Pinterest for fun ideas for the kids when there are so many great ideas in this book? A great resource for fun games and activities with kids, I wish I would have looked at it sooner. The organization is especially useful in allowing you to look for activities for age and group size very easily. I'm sure there are other books out there like this and some of them may be better. But, I have this book and I like it. It's great for those of us who aren't naturally creative in the children's activities area. As you use it, I think that it will help you as well as your child see more opportunities for creativity and fun with simple day to day objects. A fantastic resource for literally hundreds of no-tech, fun and educational games for children. Many of these games only require household items, recyclables or cheap materials to play- I love it! Fun and age-appropriate games that cost parents and educators practically nothing to make. Perfect for librarians, educators or parents looking for boredom busters or party games. BUY THIS BOOK! Keep it on the shelf and pull it out on a rainy day or when your kids say "mooooommy, I don't know what to do!" This book does mention some very basic games and activities that a lot of people have already heard of, but there are some very unique games and activites as well! It's great to have a book that is packed with lots of ideas for family fun! A must for every parent and/or teacher. Lots of activities to help teach kids or simply get them not playing video games/ watching TV. Great suggestions for themed birthday parties too. Fun book- well worth the investment! I always flip through this book each week to find projects and fun activities I can do with my 3 year old. Often times in the morning he will wake me up by plopping this book next to my pillow and saying with a sleepy voice "Let's play mommy." He knows we do fun things with this book. lots of good ideas with found objects around the house. I especially liked the list of items at the end of the chapters and book, to have on hand to recreate the games/toys mentioned. It makes a good shopping list to keep in your purse to refer to from time to time as you build your stash. I checked this book out from the library and went through it looking for things to do with my kids. I had so many pages marked (over 40) to copy that I just decided I would go out and buy it! LOL So, I did! This book has soooo many great ideas in it! I love it! great book for parents and teachers! I got this at the library but, it is more of a book you should have in the home to reference from time to time not read all at once. Lots of activities, play behavior tips and party ideas for kids ages 0-10. I great addition to any family library. Lots of ideas in this book. Tons of games and things for kids to do. A lot of them take preparation or supplies I don't have handy. Great for a preschool or parent who needs ideas to entertain children. Great ideas that I would love to use for my boys, and most of them are quite easy to do. The birthday parties looked a little overwhelming, but probably more because I can't really imagine that many kids at a party yet. I want to own this book. This book has a lot of things in it that you've heard of or could easily think up yourself if you actually sat down to do it. I'm trying to get some easy summer ideas ready, and it was good to flip through and jot down. This is an awesome book for anyone with kids! I consider myself a fairly creative person and there were games and activities in this book I would never have come up with. I just keep going back to it for new ideas. Skimmed this one. Pretty obvious stuff for toddlers but might want to go back later on. Great for kids and the adults who love them. the toddler activities are very repetitive. a better read would be any activity book by mister rogers. Excellent book if you have kids! I love all of the great game ideas that kids can be taught to play instead of sitting in front of the TV. A worthy read for any parent. Full of many fun and educational game ideas, and well organized by age, solo or group games, outdoor or indoor, etc. I took lots of notes!